My use case description: customer and site admin need to get a notification email with attached .txt file in special format where all products are listed (for later import in 1C accounting software). 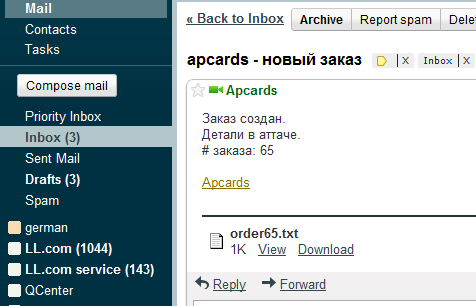 This email is sent when order is placed on website. Go to http://drupal.org/project/mimemail and grab latest 6.x branch version. Enable it in Drupal admin modules page, and check mimemail settings at admin/settings/mimemail (there is no need to change anything to make our new code work, though). You need to use your new custom module. My module has 'sitehelper' name (I use that module name for small pieces of custom code, on all our projects). By implementing caaction hook, we register new conditional action so it can be selected in CA admin section. This is my custom action. This function is executed every time customer creates an order, and the main line here is mimemail() call which generates and sends html email with attachment. I wanted to use my action when customer creates an order, so I've clicked "Add a predicate" on Conditional Actions settings form, and selected "Customer completes checkout" trigger. After I've clicked submit button, I've skipped "conditions" settings form for this predicate, and on "Actions" tab I've selected my new action.